The potential of landing the cornerstone of a franchise rebuild is something every team hopes for. But recently, there have been a number of teams attempting to secure a top draft pick by “tanking,” a strategy that has become quite the polarizing issue both in Buffalo and across much of the NHL. For the Buffalo Sabres, that spot is painfully close yet again this season, as the hapless Sabres find themselves dead last in the NHL with 56 points. The Sabres have three glaring issues as their organization is currently constructed; goaltending, top end scoring, and organizational depth at all positions. There are no college free agents this season likely to solve the first two issues, but there will be quite a few options to address organizational depth and Buffalo natives Andrew Sturtz and Dylan McLaughlin could be two of them. Although both players come from the same area geographically, their road to NCAA success have gone been quite different. McLaughlin, a 5-foot-11 190 pound center from Lancaster, NY began his road to NCAA success with the Buffalo Regals 16U of the T1EHL. 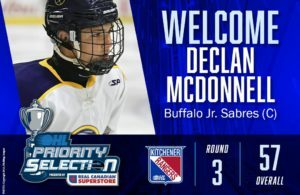 His standout season with the Regals caught the attention of USHL scouts and McLaughlin was drafted by 9th overall by the Sioux Falls Stampede in the USHL Futures Draft and was also selected in the 7th Round of the OHL Priority Selection by the Brampton Battalion. Dylan made the jump to the USHL the following season and managed 1 goal and 6 assists in 48 games as one of the youngest players in all of the USHL. 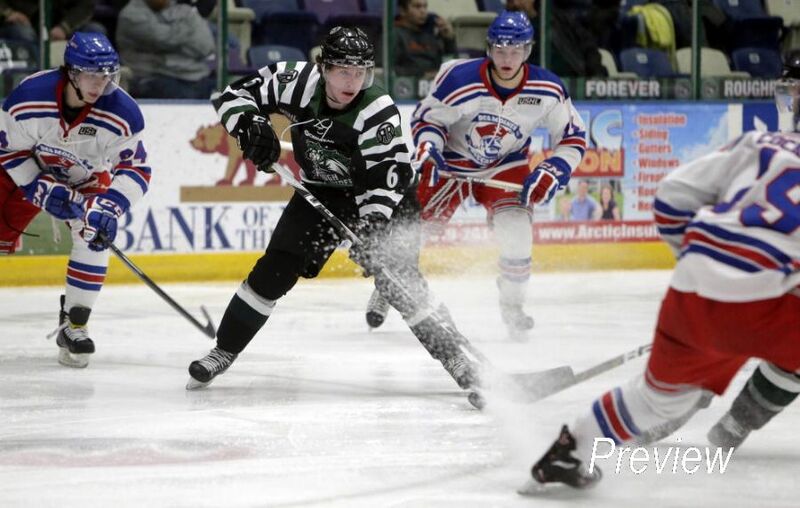 Following an off-season trade, McLaughlin landed in Cedar Rapids, and in a much better situation developmentally, with the RoughRiders. In his first season Dylan McLaughlin managed to make his presence felt almost immediately after a ridiculous between the legs shot went bar down and earned him the #1 play of the day on ESPN SportsCenter’s Top 10. Dylan would go on to score 8 goals and 7 assists in his first season with Cedar Rapids. The following two seasons would be where Dylan would make a name for himself as one of the top playmakers in the USHL. McLaughlin finished both 2013-2014 and 2014-2015 with 8 goals but tallied 26 and 31 assists respectively in back to back campaigns. 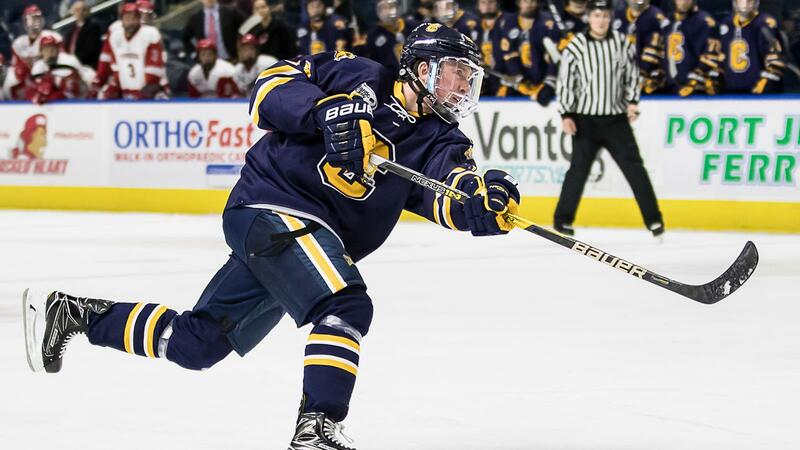 After a previous commitment to the University of New Hampshire fell apart, Dylan made the choice to continue playing hockey with his hometown Canisius Golden Griffins. Dylan’s first season for the Griffs played out much like his first season Cedar Rapids, again finishing the year with 8 goals to go along with 18 assists for 26 points in 39 games, his ability to make plays translating immediately and without a hitch. As a sophomore last season McLaughlin’s scoring took a noticeable step forward. Playing on a Top 6 scoring line for Canisius his totals jumped to 14 goals and 19 assists for 33 points in the same 39, all of which were 1st for the Griffs, earning him a Third-Team All-Atlantic Hockey selection. Although his 2016-2017 campaign was a step forward, this season Dylan McLaughlin has exploded onto the national scene as a Top 5 scorer in all of college hockey essentially from start to finish. 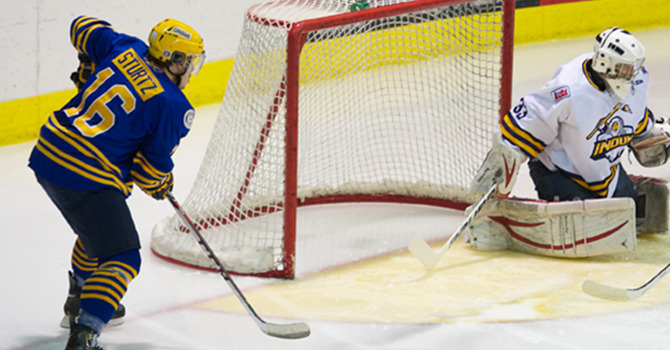 After bowing out of the Atlantic Hockey tournament, Canisius’ season, as well as Dylan McLaughlin’s, came to an unfortunate end. But as far as production goes, things could not possibly have gone any better for Dylan who finished the season with 17 goals and 31 assists for 48 points in 37 games, good for a 1.3 points per game average and was recently named a Top 10 Finalist for the Hobey Baker Award given to college hockey’s top player. Dylan McLaughlin is a very smooth skater and although he’s typically is seen as a playmaker, he is more than capable of scoring goals as evidenced by the 17 he put on the board this season. His game as a playmaker may need some development in the AHL if he were to sign with Buffalo as their center depth currently has Jack Eichel, Ryan O’Reilly and Evan Rodrigues ahead of him. Slotting McLaughlin in as a 4th line center wouldn’t make sense based on his playing style and eventual ceiling but if he were to move to wing, there could be opportunity for him sooner rather than later. 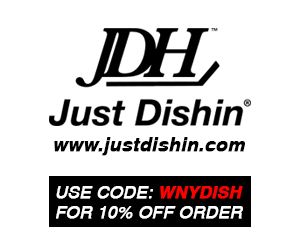 Now that the Canisius College Golden Griffins season has ended Dylan McLaughlin will be a very sought after free agent and will have some choices to make. It remains to be seen however whether or not the Hobey Baker finalist will return to Buffalo for his senior season or sign with an NHL team. If he does decide to forgo his last year of NCAA eligibility, there could be as many as 8 – 10 teams interested in adding the NCAA’s 7th leading scorer this season and Buffalo could certainly benefit from being the one who actually does. Like Dylan McLaughlin, Andrew Sturtz also calls Buffalo home, but his road to the NCAA was quite different. 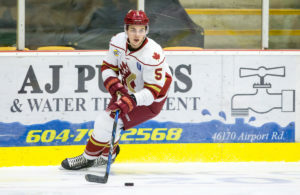 Sturtz played two seasons in the former EmJHL with the Buffalo Stars before bouncing between three different organizations in the Jr. B Greater Ontario Junior Hockey League (GOJHL) during the 2011 – 2012 and 2012 – 2013 seasons. The following season was nothing short of a breakout year for Andrew both then, and still today. After moving up to the Jr. A Central Canada Hockey League (CCHL) with the Carleton Place Canadians, Sturtz lit the league, and all of Canadian Jr. A hockey, on fire. Scoring at close to a 2 point per game rate, Andrew finished the season with 51 goals and 53 assists for 104 points in 58 regular season games while also adding 10 goals and 9 assists in 14 playoff games. Unfortunately the Canadians lost in the CJHL finals, but there was a lot to be happy about. Following the season, Andrew took home the CJHL MVP Award as the best Jr. A hockey player in Canada, but more importantly, earned a scholarship to play NCAA Division I hockey at Penn State University. Following another season with the Canadians, Sturtz took his game to State College, PA and his impact was felt immediately. Although just a freshman, Andrew’s scoring ability helped him fit right in on a scoring line for Penn State, ultimately finishing the year with 18 goals and 9 assists for 27 points in 37 games. The 2016 – 2017 season went much the same way for the Buffalo, NY forward but he managed to increase his totals to 22 goals and 15 assists for 37 points in as many games. In addition to his offensive contribution, Sturtz was the catalyst for much of Penn State’s post-season success. The Nittany Lions would go on to win the Big 10 championship, earning a berth in the NCAA tournament where they steamrolled a solid Union Dutchmen team 10-3 in the opening round. Even though they fell to eventual National Champion Denver in the next round, Penn State & Andrew Sturtz both had successful seasons by anyone’s standards and teams around the NHL started taking notice. After landing on more than a few scouting department’s watch lists during the season, Andrew earned an invite to the Pittsburgh Penguins Development Camp after it. 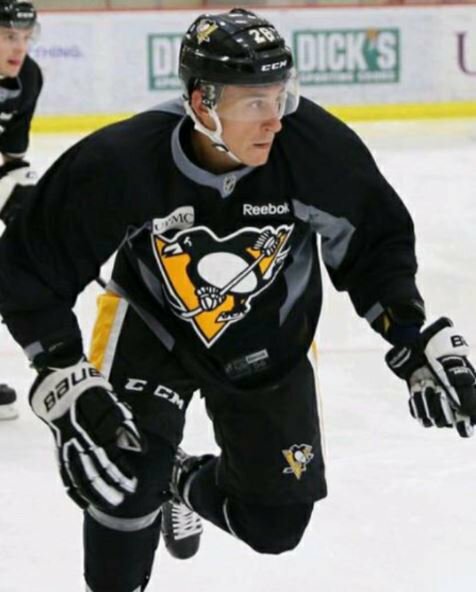 Sturtz received enormously positive reviews for his play at Development Camp and will likely be one of the teams putting on a full court press to sign the 5-foot-8 185 pound winger. Much like his previous two seasons, Andrew Sturtz has again put on an offensive display netting 14 goals and 26 assists for 40 points in 36 games as well as a nomination for the Hobey Baker Award. Although Penn State did not make it out of the Big 10 Tournament, they received an at-large bid and will play defending National Champion Denver this Sunday March 25th at 7 PM. In the opinion of many – myself included – Andrew Sturtz’s game is very likely to translate to the NHL. He has the speed to contribute to a Top 9 line immediately and is not afraid to play a game much more suited to a larger player. He has very soft hands and has added a very nice ability as a play maker to his resume the last two years. When he is on the ice he is very hard to miss and it seems like he is everywhere the puck is at all times. One thing you will never be able to say about Andrew Sturtz is that he takes shifts off. He is as hard-working and tenacious of a hockey player as you will find in NCAA hockey and although he likely doesn’t have the same ceiling, his game is quite similar to that of Brad Marchand. The Sabres will likely make a very strong push to try and sign Sturtz as a free agent after the season but from what I’ve been told, there are very likely 10 – 12 teams that are going to try to and sign him as well. For the sake of the Buffalo Sabres organization, hopefully the draw of coming back and playing in his hometown is strong enough to get him to sign on the dotted line.